One year after meeting David Aebischer, Eurolanche members returned to Switzerland. Five members from Slovakia and the Czech Republic spent two days in eastern Switzerland, where they visited to Zurich, as well as one of the smallest countries in the world, Liechtenstein. The complete photo gallery of the trip is available at this link. The main purpose of the trip was a meeting with Colorado Avalanche player Sven Andrighetto near Zurich. The Swiss forward answered all questions from the fans, signed their souvenirs and took pictures with them at the end. 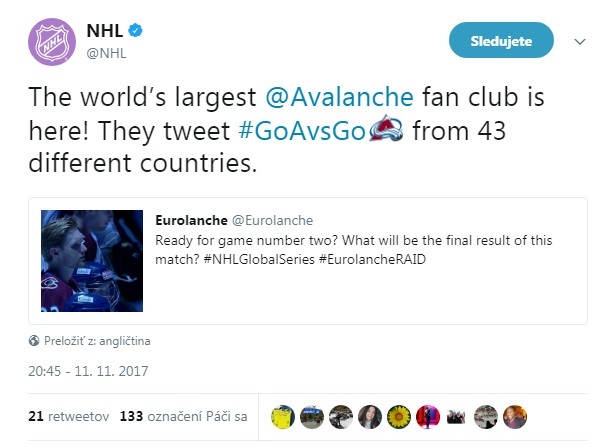 The meeting was the 17th of its kind with an Avalanche player in Europe or the US in Eurolanche history. We would like thank Sven for his time and wanting to meet us. Read our interview with him below. After three years in the Juniors and the AHL, Andrighetto made his NHL debut for the Montreal Canadiens, the team that drafted him. After almost two seasons, he was traded to the Colorado Avalanche for Andreas Martinsen at the trade deadline. He impressed the Avalanche in his first games with the team and earned a new two-year contract. The past season was his first full season in Denver. He only played 50 games due to an injury. He scored one of the most important goals in the playoff series against the Nashville Predators, scoring the game-winner in Game 5. He scored the only goal for Switzerland in the shootout of the gold medal game as his team fell to Sweden. Andrighetto and Aebischer are the only Swiss-born players to have played for the Avs in team history. How would you sum up the past season from your point of view? Very good, we made the playoffs. We surprised a lot of people, but we knew that we could make it. And how are you satisfied with your season personally? Also very good, but I was injured for a long time, so that was new for me and it was, as I’ve said, a very long time – I missed 32 games. Was it hard to get into the lineup after such a long time? It was hard, because I was out for two and a half months and if you don’t play for that long, it takes you a while to get back into the rhythm. But it was fine again after I had played a couple of games. The entire team made a remarkable turnaround, especially after the Duchene trade and the two games against the Senators in Sweden. Is there a rational explanation why the team suddenly changed afterwards? Not really, but the Sweden trip was really good for us, because it was kind of like a bonding trip. Even though we lost both games, it was the best trip that could’ve happened at this point to our organization, because it got us all closer together. From there on, we grew as a team, everyone cared about each other, everyone fought for each other and that’s how it started. How do you remember last season’s fight against Oliver Ekman-Larsson, one of your most memorable moments of the season? We were at the Pepsi Center for that game and the fans loved it. At the very least, it was funny for the fans. Yes, we had a viewing party in Brno (Czech Republic). That was definitely my favorite moment from last season. We watched it while the entire city was already sound asleep and we went crazy when you scored the goal. What were your feelings after you scored the goal? I was really happy for the entire team, because we were able to force a sixth game. Unfortunately, we couldn’t win another one at home, but it was definitely a great feeling to be able to help the team with a goal like that. It was probably the biggest goal of my career so far. Do you think that the team can improve next season? Maybe even make it to the next round? Well, we don’t want to look that far ahead, but our goal is to make the playoffs again. We want to get better every year. We’re still a really young team, but all of us, we have a lot more experience compared to last season, so that’s definitely going to help us. What would you like to improve as a team? You want to improve everywhere, in every aspect. You’re never good enough at anything and you want to get better in everything. How do you look back at your experience playing at this year’s World Championship? It was good, this was my second time [playing at the World Championship]. It stings that we lost in the finals in a shootout, but it was a good experience and great for Switzerland to finish second. It may not happen every year, but it was a great experience. Well, I like to keep them to myself, I don’t like to make them public. Would you like to get a new contract and stay in Colorado? Yes, of course. At the end of the day, that’s the big goal, but I don’t want to focus on that. You have to do a lot of things right to get to that point, but of course I’d love to stay in Colorado. We’ll see what happens. How do you spend your offseason here in Switzerland? What do you do? I work out, Monday until Friday, nine times a week, twice each day, except for Wednesday, when I only have one workout. Michal Hezely contributed to this story.